A confrontation between bases of support of the Zapatista National Liberation Army (EZLN, its initials in Spanish) and of the Independent Central of Agricultural Workers and Campesinos-Historic (Cioac-H), in La Realidad, left one Zapatista dead and 13 injured from the Cioac-H. These facts do not seem to be in dispute. However, we do not know how many Zapatistas were injured. The confrontation allegedly occurred last Friday, May 2. It also seems undisputed that the conflict originated when members of the Cioac-H retained a farm truck belonging to the Zapatistas that was used to transport their members. It is, however, not clear exactly when that may have happened. 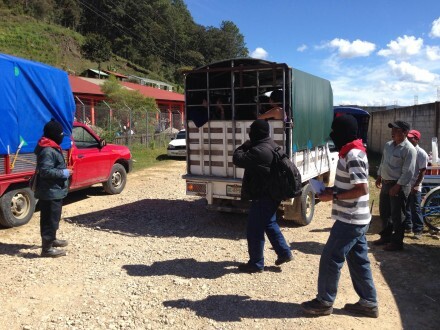 Apparently, the Zapatistas retained some Cioac-H members in retaliation for taking the truck and the confrontation occurred when other Cioac-H members went to La Realidad to negotiate their release. The Zapatistas retained the leader of the Cioac-H group and, in retaliation, the Cioac-H members cut off the water supply to the Zapatistas. It would seem important here to remember that anti-Zapatistas calling themselves the Cioac-Democratic were the ones that assaulted Catholic nuns and medical personnel in February. The national Cioac organization stated that the assailants were not part of the national organization and were just using that name. We have no information about the group calling itself the Cioac-H.